A poignant novel about the lifelong friendship between two women, Barbara and Marilyn, who once shared an idyllic childhood in the modest Riggs Park neighborhood of Washington, DC. Now. at the dawn of a new century, they’re 58 years old, each dealing with a crisis of late middle age. Marilyn has a recurrence of breast cancer. Barbara is in a difficult relationship with a man. Yet both feel driven to return to the old neighborhood to solve a decades-old mystery that still haunts them. What they discover is a heart-wrenching secret that tests them even further. Will it shatter the resilience that got them through the repressive social mores of the 1950s, the white flight from the city, the fevered years of feminism and anti-feminism and child-rearing? Or will it give them the strength to move on? 1. Like many people, Barbara and Marilyn have a nostalgic view of the old neighborhood where they grew up. How does this change when they revisit Riggs Park many years later? Is it altered more by what they see there, or by what they learn about events that happened there when they were young? Have you had similar experiences when revisiting places you knew well in earlier years? 2. 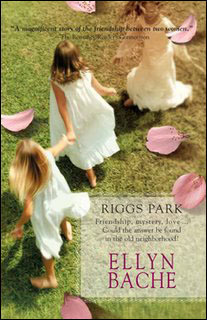 Riggs Park is a novel about women’s friendships, and particularly about the lifelong bond between Marilyn and Barbara, as well as their early friendship with Penny. Was each one always the kind of friend she wanted to be to the others? What are some of the sacrifices they made for each other? Were there times when they could have done better? 3. Barbara and Marilyn were children in the 1940’s, teens in the 1950’s, and young women in the 1960’s. To what extent have their lives and the decisions they continue to make been shaped by being children of a particular generation? Their parents grew up during the Great Depression. They themselves lived through the repressive social mores of the 1950’s, the sexual revolution and Civil Rights Movement of the 1960’s, the rise of feminism, the backlash against feminism, and many other social changes. To what extent have they adapted to these? In what ways have they not? 4. How does the phenomenon of “white flight” that affected Washington, DC, and many other large cities in the late 1950s and early 1960s, continue to influence the characters in the book, even years later? 5. Essie Berman makes many decisions that affect the lives of the children in Riggs Park well into adulthood. Are they wise ones? Should she have done some things differently? 6. In what ways is the Jewish concept of Tikkun Olam – “fix the world” – important to Barbara’s not-very-religious parents and later to Barbara and Marilyn themselves? Are they serious about fixing the world, or just conveniently adapting the idea to fit their lives? 7. As a result of their experiences and life lessons, some people mellow as they grow older, while others grow bitter. How would you characterize the changes in Marilyn and Barbara and Jon–first, over the years of their lives, and second, as a result of what happens during the months of the story?